I’m so excited that fall is finally here! Apples, pumpkins, sweaters and falling leaves match perfectly with the cooler weather and crisp, clean air. Fall baking is where I can get into trouble unless I can share my treats with many people. I like pumpkin baking but my sweet spot is apples. In fact, I recently bought a cookbook dedicated to just apples. I can’t wait to try those recipes but in the meantime, I have a tasty treat for you today on the blog that keeps your splurge in check. Well, it keeps it in check if you only eat one but really, who can do that? 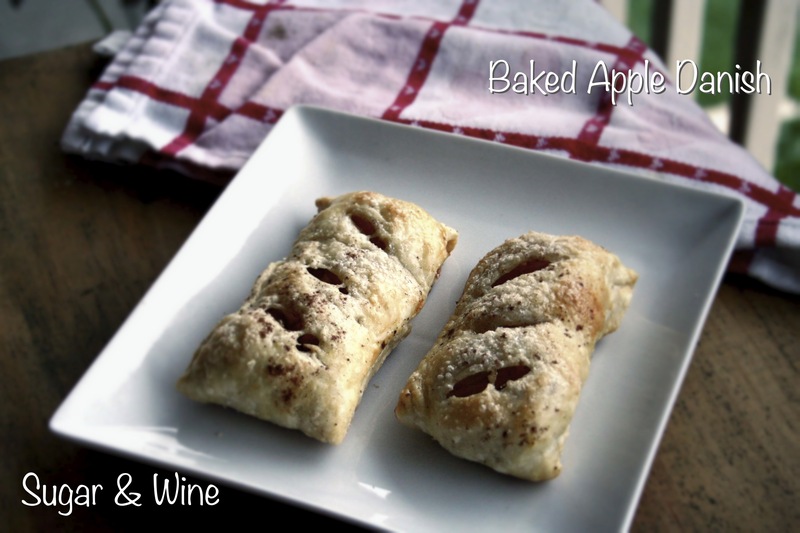 These lovely Baked Apple Danishes look an awful lot like the McDonalds pies but these are so much tastier, inexpensive and super easy to make! Pre-heat the oven to 375F. Prepare a baking sheet with cooking spray or a silpat. I didn’t use the silpat. Peel, core and dice the apples into chunks. In a pan over medium heat, melt the butter. Once melted, add the diced apples, sugar and cinnamon. Mix occasionally. Cook until tender—approximately 6-8 minutes. Set aside and cool. While the apple filling is cooking, unfold one sheet of the puff pastry onto a slightly floured surface. With a rolling pen, roll out the puff pasty until it is a 12 x 10 inch rectangle. Using a pizza cutter, cut the pastry into six even rectangular pieces (about 5 x 4 each). Repeat. Fill each piece with 2-3 tablespoons of apple filling right in the center. Fold each side over the filling and use a little bit of water to pinch and seal together the pastry. Place the danish fold size down onto the baking sheet. Cut three diagonal slits into it. Repeat for the rest of the pastries. Once they are all on the baking sheet, brush on the egg wash. Optional: sprinkle on a little bit of sugar to add some texture and sweetness. Bake for 20-25 minutes until lightly golden brown. Remove and eat! Looks awesome, apples muummmmm good my favorite.